Graduation Ceremonies - Let us Commence! 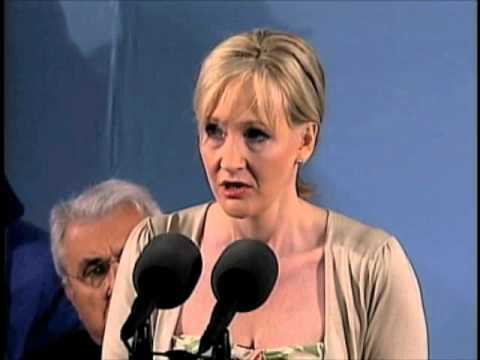 “It is impossible to live without failing at something, unless you live so cautiously that you might as well not have lived at all – in which case, you fail by default.” JK Rowling, Commencement Speech at Harvard University 2008. It’s that time of year again when the next wave of students leave the cocoon of higher education and take that brave next step into the big bad world. In this blog post we look at some of higher educations’ most memorial and inspirational commencement addresses (after a short trip down memory lane). It’s hard to think back to one’s own graduation and fully recall the excitement, the pride, the hope and the fear that infuses the day. The ceremony itself is a breeze (if not a little longwinded). Flanked beside friends, fellow students and faculty all donning an array of caps and gowns and many trying to mask a ‘mild’ hangover. Parents beaming with pride that they did their duty; for some they watch as their child continue a tradition and for others their child is the first in the family to receive a degree. It’s a day of two extremes: reflection and expectation. As one speaker after another imparted their respective wisdom to the crowd I remember that eerie silence that descended as the entire Cathedral and its occupants faded away. Thoughts of every exam, every fourteen hour cramming session, project deadline, fresher’s week, registration, every hallway I got lost in. The day I decided I wanted to quit. And the day afterwards when I decided to snap out of it. The friends I’d made and the classmates that intimidated me as they were way smarter. Then there are the thoughts of what’s next. After all graduation is a rite of passage. It’s the end of one stage in your life and the beginning of another – whatever that may be. Travel. Graduate placement or a year in a commune ‘finding yourself’. Do you remember those moments sitting on that pew trying to foresee and anticipate your future? For some it’s crystal clear; no doubts, no uncertainty – 5 year plan written in stone. For others they can guess what they’ll be doing tomorrow but not the day after that. Back in the room and the highlight in every graduation is often left to the commencement speaker. In their role as Chief Inspiration Officer, it’s up to them to impart their knowledge, their experiences and recall their colossal mistakes (to take the pressure off a bit). From Presidents, to actors, to authors and to visionaries we look at some of our favorite commencement addresses. While not addressed in this blog we ask you to consider the decision process behind a university or college selecting a specific speaker. Sometimes it’s circumstance, sometimes it’s opportunity. And sometimes it comes down to good old fashioned appeal. Have you a favorite commencement address? We’d love to hear from you. P.S. They’re not always delivered by the famous (they just have better publicists).